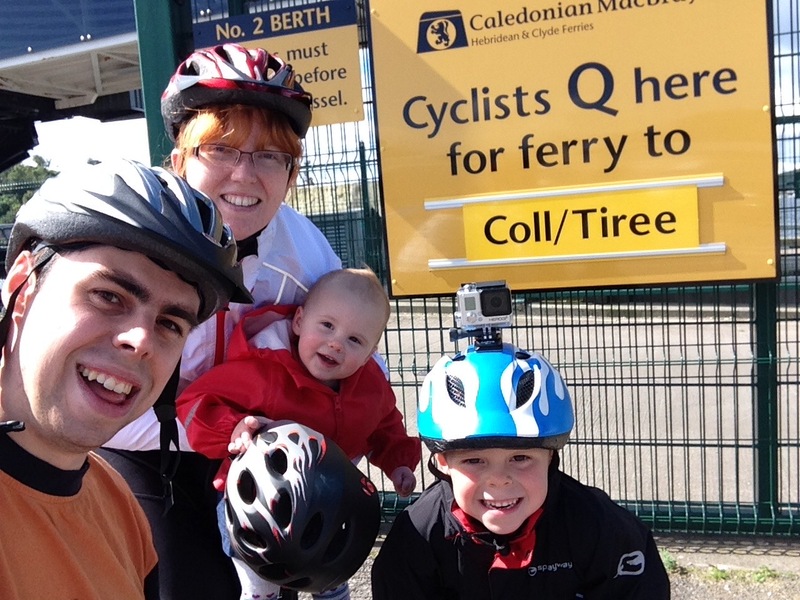 We had been here before, at the CalMac Ferry Terminal in Oban, three years previously. 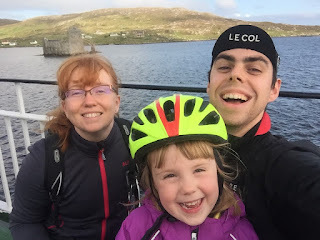 Last time, we had set off with high hopes and, thwarted by strong headwinds, had cut short our trip at Lochmaddy. This time, we had a far better idea of where we were going, places we were keen to revisit, places we had missed last time that we wanted to explore, and a whole lot of local knowledge bestowed by our generous host from the night before (including a hand drawn map of highlights and camp spots for us to visit on Barra). The forecast also promised a prevailing wind from the south for the majority of our trip. 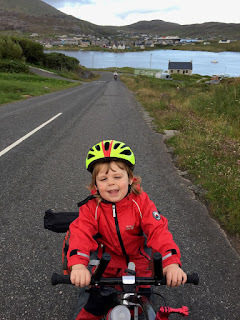 We were optimistic, and Tom in particular was determined: this time, we would cover the whole of the Hebridean Way. Tickets for the ferry purchased, we also had a spare hour to make the most of proximity to the seafood stall on the quayside for lunch. 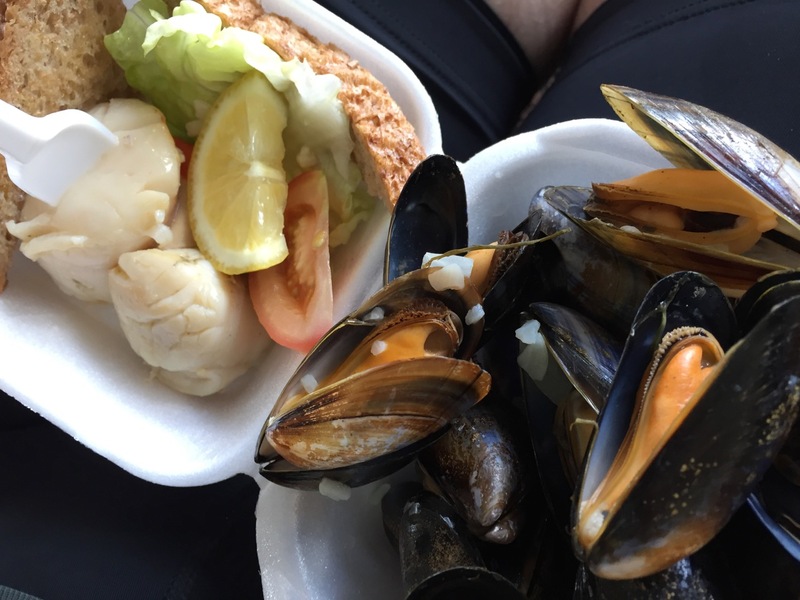 This is one of the best bits of holidays by the sea - seafood more plentiful and tasty than anything we can get at home. I set off with Ruth for a first foray, and Ruth meant business. She had, in her pocket, three coins totalling four pence, and she meant to buy us all dinner. The staff at the seafood cabin were brilliant - a lobster was extracted from the chiller cabinet for Ruth to examine at close quarters and to marvel at the pincers (held fast by elastic bands). I was only frustrated that I hadn't brought my camera with me to capture it! Ruth can now identify for herself crab, lobster, scallops, prawns and mussels, and on seeing the pictures on the menu made a few requests of her own, her eyes decidedly larger than her tummy! The staff let Ruth "pay" with her money (whilst quietly taking the real payment from Mummy) and solemnly gave her the "change" (including her original three coins). We went back to Tom and Rhoda bearing freshly cooked scallops in garlic butter, a very generously filled prawn sandwich, a similarly generously filled smoked salmon sandwich and a portion of freshly cooked mussels. The scallops and mussels didn't last long. Tom and Rhoda went back for a second go, and came back with dressed crab, a pot of prawns, more mussels and more scallops. 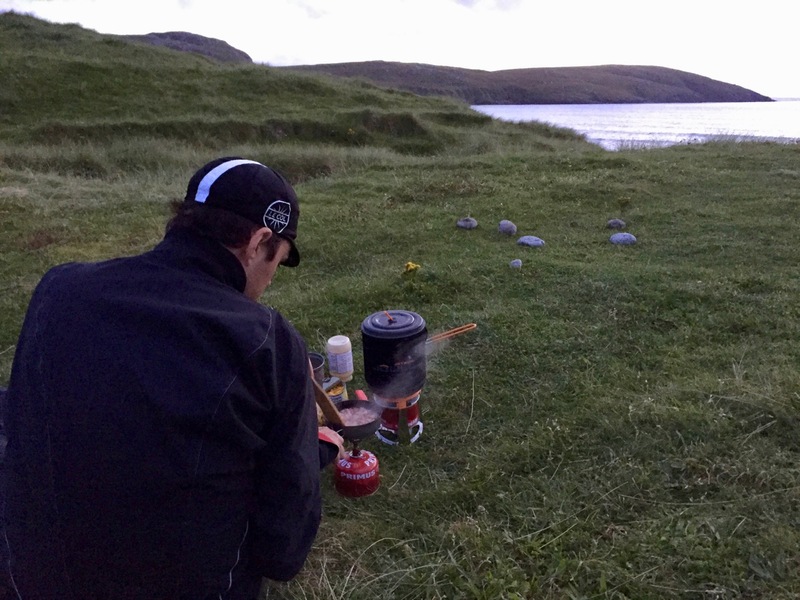 When you know that in the evening you'll be cooking over a camp stove, you make the most of good food when you find it! 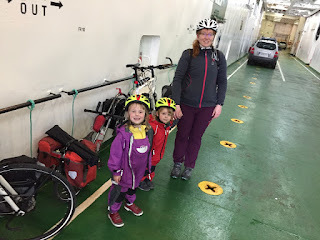 The time to the ferry departure had ticked away easily, and we gathered the uneaten sandwiches and retrieved the bikes and luggage from the rack. 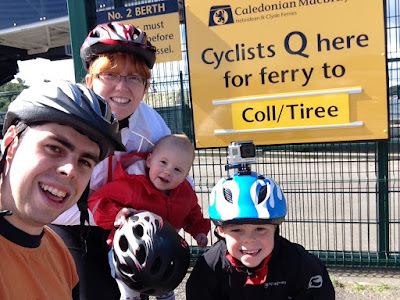 In the queue for the ferry we spotted another family of cycle tourists, and the girls were delighted to see a child conveyance they recognised - a Weehoo! In day to day life, we meet very few cyclists attempting anything like what we do, especially with children, so we were delighted to say hello. Ruth and Rhoda, in the inimitable way of children, decided that they had a new best friend. Instantly. 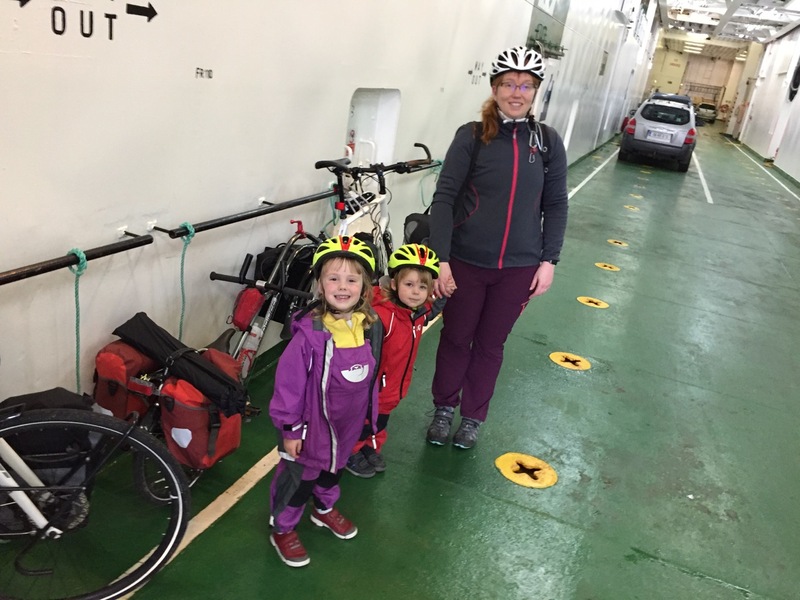 We boarded the ferry and the girls were already disappointed that our new friends had to park their bike on the opposite side of the ferry! 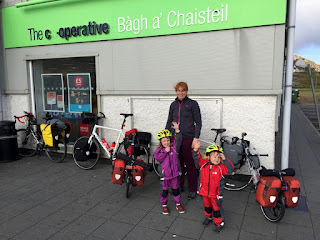 During the crossing, we chatted with Clem, Steff and Noel and found that they were intending on a circular route out and back from Oban. The weather for the crossing was kind, (unlike three years ago when Ruth was spectacularly sick in the canteen shortly after polishing off a full meal), and we had our only minor mishap when Rhoda lost her footing and barrel rolled down a flight of steps, giving herself a significant bruise to her shin. The first ‘first aid moment’ of the trip was dealt with by judicious application of an ice pack and some chocolate buttons, and Rhoda was soon back to looking out the windows with Ruth and her binoculars and playing noughts and crosses in her notebook (new game of the trip, requiring some surreptitious parental manipulation to get Rhoda to achieve the occasional win, since she generally wasn't all that bothered about whether her three noughts or three crosses were actually in a row, and was pleased with herself for taking a turn and drawing a nought or a cross anywhere on the page). 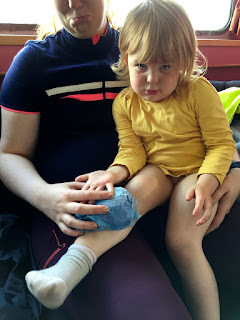 We unwrapped the sandwiches from Oban for a snack, supplemented by a bottle of Irn Bru for Tom (when in Roma…), two fruit shoots and a cup of tea. We’re so rock and roll. Rhoda also asked for a hot chocolate, and was surprisingly patient about letting it cool down. The girls made friends with a dog and its owners, travelling in the pets area by the staircase, and enjoyed much enthusiastic patting. Ruth and Rhoda seemed surprised to see a dog on a boat- the idea that pets might travel on the ferry hadn't occurred to them. 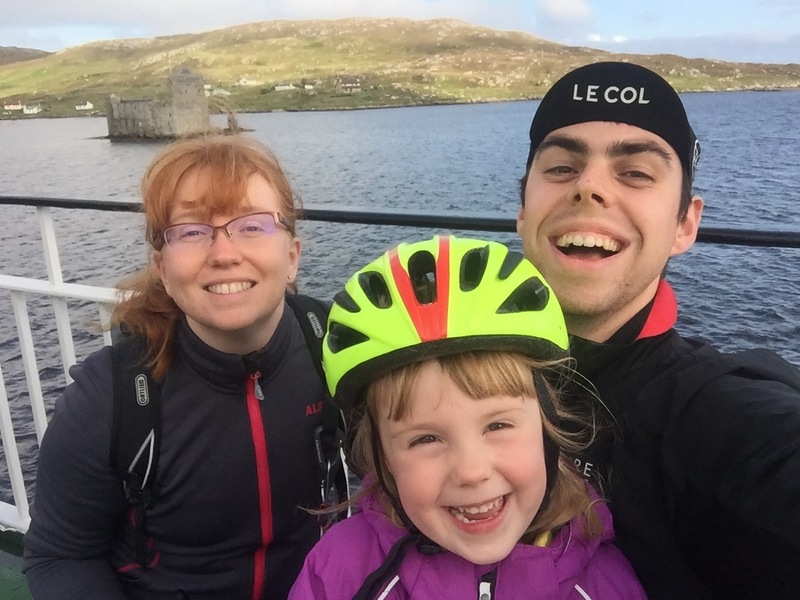 As we approached Castlebay, we took the girls up on deck so that they could enjoy the view of the eponymous castle as it came into view. Tom and I took a good look at the beaches on Vatersay as we passed, as we were planning to head there to camp for the night. The weather was dry but the cloud hung low over the hills as the ferry made its way in. We were glad that we weren't starting out on the big climb up out of Castlebay to the east this time, as it looked like the road was disappearing right into the cloud. Instead, when the ferry disgorged, we paused to let all the cars set off on their way, before heading down to the Co-op to stock up on food and water. A motor home beeped and its driver and passenger waved as it passed us- it was the couple with the dog. Ruth and Rhoda waved back exuberantly. 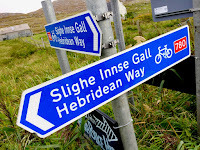 On our last trip, we hadn’t been over the causeway to tiny Vatersay. 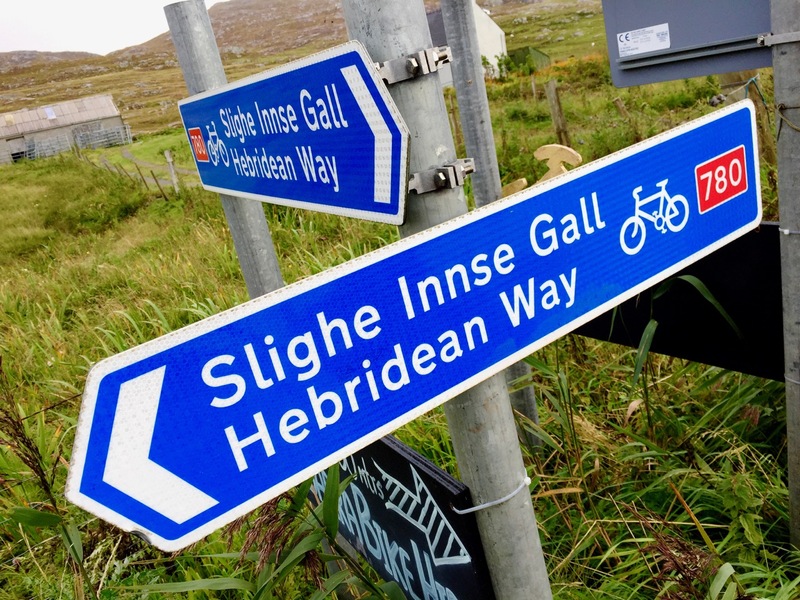 This time, we were determined to start at the very bottom of the Hebrides, and that meant tackling the only climb marked on the OS Map with arrows to indicate its sharp gradient profile. 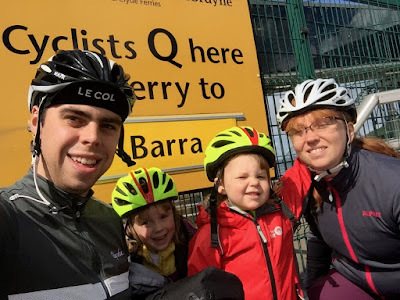 We set off with the brave (stupid?) aspiration of slogging up it without pushing, with Steff and Clem along too. 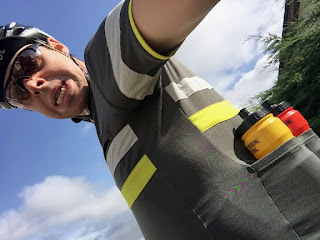 I was soon in my granny ring, wishing I had changed the cassette for one with more teeth, when a local lad on a road bike passed us with a cheery wave. 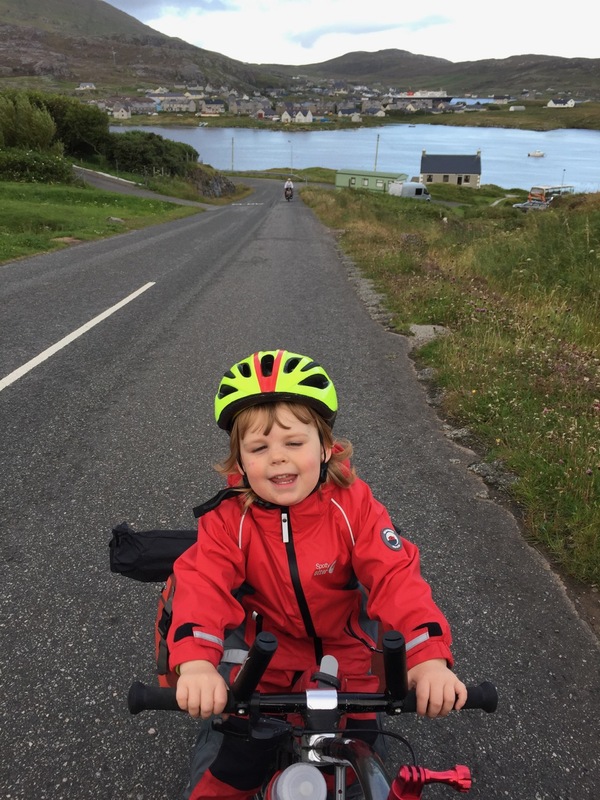 My heart sank when he stopped about fifty metres further on to get off and push - if he couldn’t cycle up it on an unloaded road bike, how were we to fare slogging up there fully laden on touring bikes, towing the children? As it happened, I needn't have worried. Tom made it at least as far as the cheery local chap before abandoning: we cycle tourists are clearly made of tough stuff! Ruth and I stopped for a quick photo of the ferry as the climb offered a lovely view back across the bay. 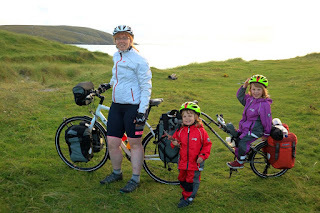 Ruth was astonished at how far away and how little the big boat that we had just left looked, and proudly got her own camera out of her top tube bag to capture the moment for herself. We stowed everything away, and I braced myself to push the bike up the remaining 12% slope to catch Tom, Steff and Clem. It was at this point, that Ruth proved herself to be rather a smart little cookie. “Look Mummy, I’m helping!”, she announced, determinedly changing her gears and starting to pedal. And she wasn’t kidding - the bike lightened measurably as I pushed it, our pace quickened. I was rather ashamed that I hadn’t even thought to ask her to pedal as I pushed - I had just assumed that because the going was tough, she would want to rest. 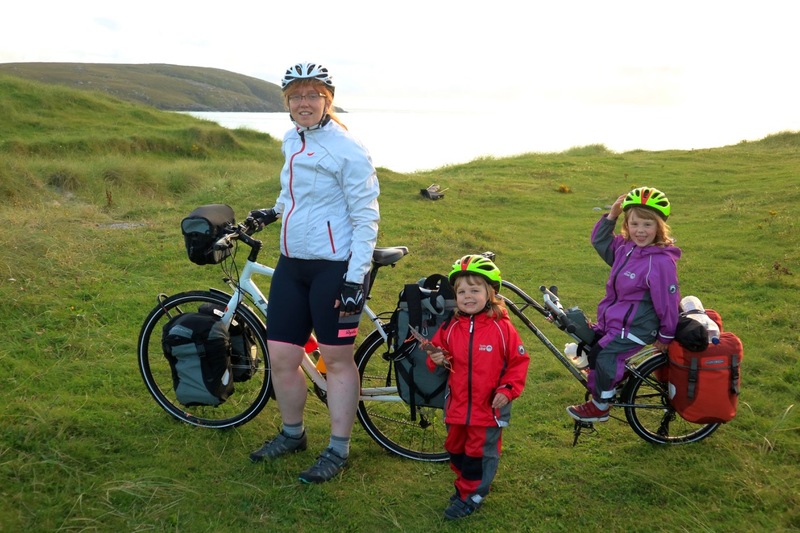 This was the first lightbulb moment where I realised that Ruth had her own ambitions for this trip, and she was not planning to be a mere passenger. 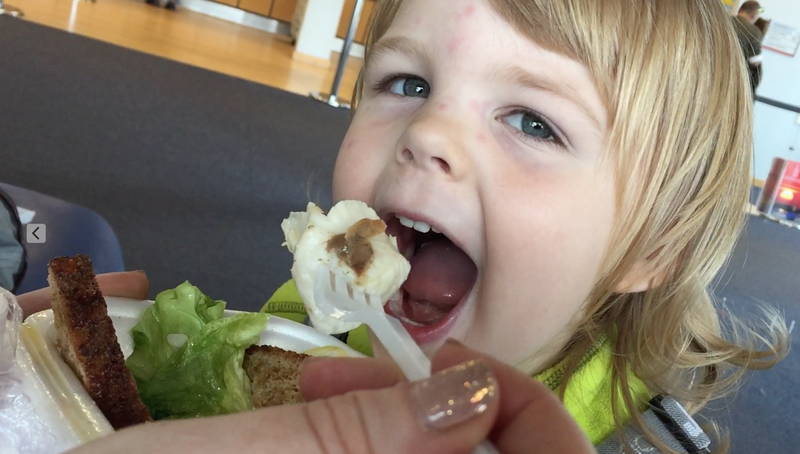 I looked at my baby - a baby no more, and was awestruck at the strength of personality she is already exhibiting. As we neared the top, Tom saw the effort she was making and called out praise and encouragement for her. She dug in even more, visibly proud of herself. The gradient eased as we neared the war memorial at the top of the climb, and we caught Tom and Rhoda, who had stopped to wait for us (Tom had beaten me to it, despite the “help” from Rhoda only consisting of her usual backwards pedalling). Ruth’s disappointment that Steff, Clem and Noel had gone faster than us was very vocal. She wanted to ride with our friends, and if Mummy wasn’t up to it, she was single handedly going to propel us to catch them up. What Ruth still has to learn is that whilst we may well not have been as quick on the way up, all that extra weight does have its advantages on the way down! With minimal effort, we were soon freewheeling down the other side with gathering speed, gravity doing all that was necessary to catch up the gap, and the wind soon swung in behind us too. We whizzed along a little further with Steff and Clem, over the causeway, before they decided to turn off to find a camp spot. We had already determined upon heading to one of the two beaches at the end of the road (depending upon which way the wind was blowing), so we carried on, swooping down quiet roads, and passing a group of ladies on road bikes at the side of the road, who looked as if they were about to set off having fixed a roadside mechanical. When we reached the beaches , it was a really easy choice of where to pitch - one beach was sheltered, the other was facing the full force of the wind. We pushed the bikes through a gate and up a path over the dunes towards a stile. We could see a couple of people already there, and when we reached the top, we saw a large teepee already erected looking out over the sea. The people we had seen as we laboured up the dunes were unloading large quantities of cushions and duvets into the teepee, the sort of romantic looking camping gear that is hugely impractical - quick to get damp and slow to dry, heavy and cumbersome. 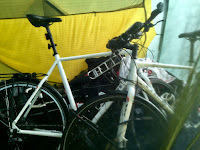 Then there was all their kitchen paraphernalia - it looked more like moving house than camping! 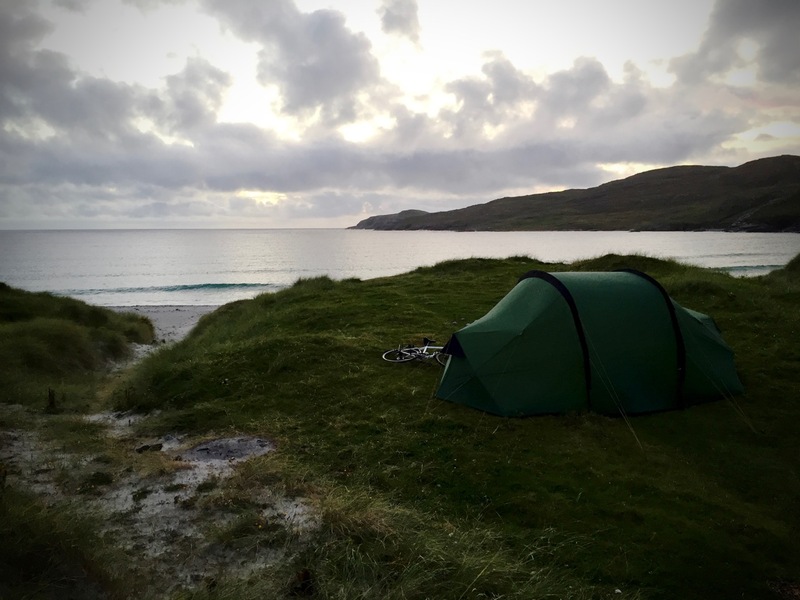 We looked back at the six bags on each of our bikes, and once more wondered why anyone would think they really needed so much STUFF just to spend the night in a tent. The ladies on road bikes that we had passed a couple of miles back arrived and came to take in the views. They stopped to chat, the girls’ cuteness factor having attracted their attention. They were travelling light and bright - a group of friends from across the UK reunited for a summer cycle trip (but no camping). They also watched the performance with the teepee. As they turned to leave, Tom and I decided that we would find our camp spot further up, and we strolled along looking for a nice flat patch big enough to take the tent, ideally not visible from the road or the houses beyond. We even managed to get the tent up and all our gear inside before the midges really descended. The new Alpkit tent pegs found purchase in the sandy ground, no problem. Money well spent. 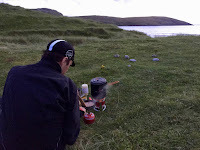 Tom did the honours with the cooking and braved the midges, whilst the girls stayed zipped in their inner tent and I inflated sleeping mats and shook out sleeping bags to loft. This was the bit of the day the girls liked the least - whilst the midges swarmed outside in the shelter of the tent, the girls were cooped up when they really just wanted to run around. It was already getting dark, because it was already early evening when the ferry arrived. We promised Ruth and Rhoda a proper beach trip in the morning, scoffed our pasta, and heard the first drops of rain start to pit pat on the fly sheet. Tom looked at me - “Do you think we can get the bikes in here? It would be a shame to get everything soaked on the first evening of the trip.” Only one way to find out! 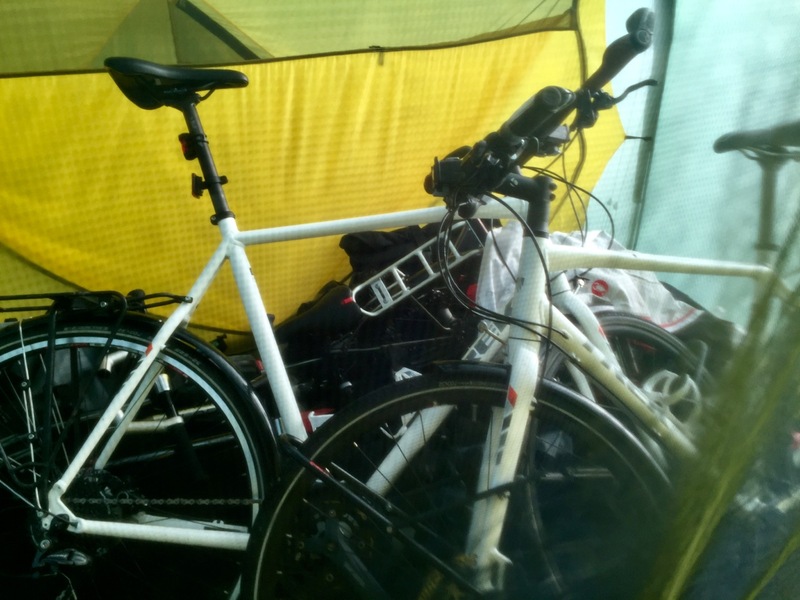 We piled the panniers down either side of the vestibule, and brought in first the two trailer bikes (laid to try to avoid damage to the derailleurs and to avoid the drive trains coming into contact with the tent inners), then my bike, and finally Tom’s bike. Everything inside! It was certainly cosy, but we had no problem creating a route from each inner to the tent door, and with the girls already tucked up in their sleeping bags, the vestibule space would only be wasted overnight whilst we all slept. Tom and I were ready to escape the midges by battening down the hatches in our inner tent.